Social media has a big role in changing the way we experience life – from simple communication to changing lifestyles and restaurant marketing. Restaurants have become a great prey for smartphone activities. Consumers take snapshots of their food especially when it comes to great plating and express feedback through Yelp, making restaurant owners take notice of it. Most restaurants rely on Yelp for customer reviews and sometimes, that could lead to a problem. On one hand, dealing with amateur food critics who easily pick apart a business without any considerations and who don’t even respect the workers there can be really a handful. On the other hand, Yelp does not have an escape on that. According to sources, the site may hold more power than realized beforehand. A restaurant whose average Yelp rating increased by one star can expect a 5-9% rise in revenue, according to research. Whether or not restaurant owners like social review sites, their business’ influence is not taken lightly and they have to continue the job. Social media’s first purpose is for interpersonal communication through the web. But with the growth of it, businesses from all industries are all competing to attract the social users by setting up profiles and fan pages in boosting their promotional posts as long as it is still allowable by their budget. 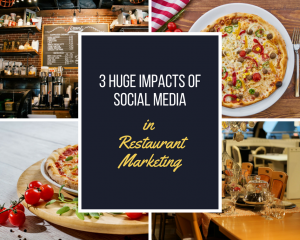 Social media helps restaurant owners to revamp their marketing campaigns. With the help of digital marketing tools, the following results are made possible. Responsive campaigns. Everything from Facebook ads to pinned Twitter posts can be edited, so make sure you post correct information for your customers. Ongoing interaction. Acknowledging customer feedback by being responsive shows that restaurants value the customer’s opinions and listen to them attentively. It means that restaurant owners consider it very important for growth and improvement. Increased control. Social media marketing can be controlled through the restaurant’s computer or even through a smartphone, and there’s no need to rely on agencies anymore. We tend to think of Instagram as a place to see everything that’s easy on the eyes, but some restaurant design firms are taking Instagram into account long before they even break ground on construction. Designers get inspired by the colors of raw ingredients and remarkable plating styles. Oblong tables are tools in shooting farm-fresh eggs while weathered woods that act as breakfast bars in a coffee shop may be likened to that of a dilapidated barn style in an Instagram post. Once the restaurant is fully furnished, the more it becomes “Instagrammable”. The quality of the photo can become a good marketing strategy.